This timeless traditional chest from Home Styles blends well into any style of decor. Its manufactured wood exterior is finished in a tasteful black colour. If "simplicity" and "elegance" are the words you live by, then look no further: you've found the right 5-drawer chest for your little treasure's room! We like its versatile look, which blends easily with whatever might inspire you and we guarantee you'll like it as much as we do! 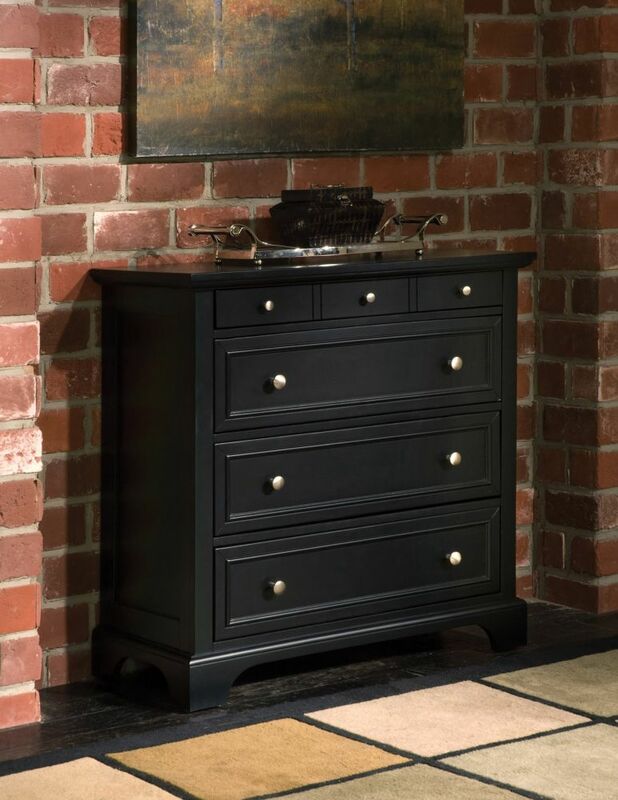 Bedford 36-inch x 36-inch x 16.5-inch 4-Drawer Chest in Black This timeless traditional chest from Home Styles blends well into any style of decor. Its manufactured wood exterior is finished in a tasteful black colour. Bedford 36-inch x 36-inch x 16.5-inch 4-Drawer Chest in Black is rated 4.0 out of 5 by 7. Rated 4 out of 5 by rematenaj from I really like this dresser. Not too big, made of solid wood. It was a little difficult to put t... I really like this dresser. Not too big, made of solid wood. It was a little difficult to put together, as I am an old woman, but I managed and am very happy. Bought two! Rated 4 out of 5 by kss from It's a nice product and I'd buy it again, especially... It's a nice product and I'd buy it again, especially at the price-point I was looking at. But given the high quality of the materials, it's a bit frustrating that there isn't a center track for the drawers to stay on -- there are only the two metal railing the drawers slide into. Rated 5 out of 5 by Sherry from Well made chest with detailed directions for assembly. I... Well made chest with detailed directions for assembly. I am very pleased with this product! Rated 1 out of 5 by Maria from No, It was a horror to put together the drawers... No, It was a horror to put together the drawers did not fit correctly. piece of garbage. If I had not thrown the box away and the piece was to large to fit in my car I would have returned it. Definitely not worth the time and aggravation. Eventually I will throw out in the dumpster if I could find someone to help me. To toss it. Never again! You get what you pay for (garbage). Rated 5 out of 5 by Anonymous from Good piece Easy set up, looks great. The last installation step is really hard though. You have to make the faces of the drawers match with the openings and it's impossible. It's hard to describe but it's a pain when you get there. Definitely recommend! Hello Heidi. This item does require assembly. If you need assistance, please contact your local The Home Depot to find out more about their assembly and delivery options. Thank you.